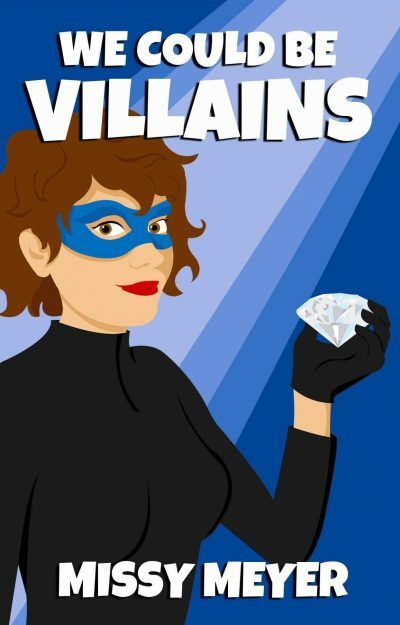 2014’s We Could Be Villains is the first volume in Missy Meyer’s Valentine & Hart series. Sarah Valentine has an unrewarding job working for Seattle software company WonderPop. Her social life isn’t too hot either. Small wonder that when she meets personable mail room employee Nathan Anderson, she embraces the opportunity for a dalliance. She is rather disgruntled when Nathan suddenly vanishes without so much as a goodbye. Next: Sarah finds herself collateral damage when Seattle’s own super-hero team, the Ultimate Faction, takes an interest in WonderPop. Sarah and Nathan’s meet-cute involved the Faction. Firewolf showed up to assist with an unexplained fire in WonderPop’s building. Firewolf’s powers have more to do with starting fires than putting them out, but that didn’t stop him from trying to get credit for the assist or the press from publishing accolades. Just another day in Seattle. Sarah and Nathan’s second meet-cute also involved the Faction. Commander Alpha, well-known strongman of the Faction, arrived after business hours, convinced that miscreants were up to something bad inside the WonderPop building. Having a limited toolset, he alternated shouting at the hypothetical bad guys to surrender with beating the heck out of the building. Sarah, still in the building, didn’t flee fast enough to avoid the collapsing ceiling. Three days later, Sarah recovers consciousness in a very high-tech medical centre. Alpha was right, there was a criminal mastermind in the building: the notorious Doctor Oracle and his minions. Rather than trusting the heroes to notice that they caught a civilian in the cross-fire, Oracle evacuated Sarah to a secret tropical-island base. Oracle is, of course, Nathan Hart himself . He feels some affection, some responsibility, for Sarah. But that’s not all that’s involved here. He is convinced that Sarah has what it takes to be a successful member of the Doctor Oracle team. Why should she waste her talents working for WonderPop when she could be a supervillain instead? As annoyed as she is with Nathan, the job offer is very enticing. The benefits are good and the work will certainly be more interesting than anything that would come across her desk at WonderPop. The Midnight Star belongs to the Faction’s own Green Lady. The Doctor Oracle Team has a leak that is sending information right to the Faction. Commander Alpha of the Faction has a long, ugly personal history with Doctor Oracle; he’s certain to use the diamond as bait for his old foe. I would ear-flick Sarah for her snide body-shaming but she’s a supervillain. It’s probably a job requirement. One of the reasons Sarah is so quick to join Team Evil is that Team Supposedly Good isn’t particularly good or even useful. The Ultimate Faction has been the darling of the Seattle establishment so long that all they want to do is bask in their fame. They’re a bunch of status-conscious super-jocks, with little consideration for the feelings or needs of the little people. That’s quite clear — even before they discuss the feasibility of disappearing their captive, Sarah, if she proves useless. It also becomes clear that being one of the Ultimate Faction’s junior members is a craptastic job. The Faction is not going to waste money on nice dorms or a decent cafeteria if that money could be lavished on the team’s top talent. The Ultimate Faction plays at being the Good Guys; it is obvious that they are Bad Bosses. The other reason Sarah is easily recruited by the Black Hats is that Doctor Oracle and his pals are not all that bad. They avoid collateral damage and take care of their employees. They even find time for covert good works. A: The ‘welcome to our island utopia’ went on a bit long. B: Sarah’s rapid promotion within Team Oracle is not quite credible (graphics design peon to member of inner circle), but hey, she’s the current boss’s girlfriend . C: Supervillains as Robin Hoods is a legitimate twist but it would have been nice if the revelation (the Ultimate Faction are dicks  and that Oracle et al. aren’t) came as any sort of surprise. Still, I enjoyed parts of this enough that I will give the second volume a try. We Could Be Villains is available here (Amazon). I could not find it at Chapters-Indigo. 1: Actually, Doctor Oracle is more of a role than a personal and Nathan is only one of the members of his organization who takes turns behind the persona. It’s a cooperative! Thumbs up! 2: Nathan says he abstained from voting on matters pertaining to Sarah, since they dated, but A: to what degree are his colleagues willing to piss him off by giving Sarah a black marble? and B: are super-villains entirely honest people? 3: In Alpha’s case, he’s reacting to the life of bullying and abuse he suffered before a suicide attempt imbued him with super-human strength and durability. His behavior may indicate that the Faction has not splashed out for a team therapist. I read that traditional pirates were quite democratic in their decision making. I dunno about current ones. Amongst various explanations over time for Reed Richards not curing Ben Grimm of being an ugly blob of rocky muscle, I think haven't seen it proposed - even by Ben in a bad mood - that he's only useful as an ugly blob of rocky muscle. Although most times he's been temporarily cured, a situation arises that requires him (in his opinion; canonically there's a psychological component) voluntarily to be un-cured. And there have been various "evil Reed Richards" versions; Warren Ellis's "Planetary" includes "The Four" as anti-futurist super bad-guys. Props to the author for doing her world-building. Negative props to the author for dragging the reader willy-nilly on an involuntary tour of her island base's agricultural sector rather than getting on with the story (in other words, a telling-not-showing fail so protracted it was impossible to ignore). From your review, there doesn't seem to be anyone named "Hart" in the Valentine and Hart series.